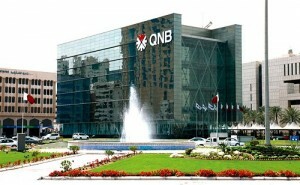 QNB expressed Friday their optimism on the performance of the Qatar equity for the long-term, saying that the selling made as response to declining oil prices this year were overdone. A report released today by QNB Financial Services said it expected the Qatari economy to show resilience in face of lower oil prices. The report attributed three reasons to that conclusion: 1) a relatively low fiscal breakeven oil price, at $60.7/b in 2015). 2) The accumulation of significant savings from the past. 3) low levels of public debt. The report expected Qatar’s real GDP to grow from 4% in 2014 to 4.7% in 2015 and 6.4% in both 2016 and 2017 as the country expands in investment spending in non-hydrocarbon sector. The non-hydrocarbon sector for its part will remain “the engine of growth”, based on QNB’s research. Non-hydrocarbon GDP growth will be at 10.4% in 2015, followed by 9.9% in 2016 and 10% in 2017. QNB also expected stronger earnings of Qatari companies covered by the report, by an average of +6.5% increase in 2016. The main reasons for that increase is improvement in oil prices, better global growth and an easing of geopolitical tensions. On the other hand the main risks are “depressed oil prices, increase in volatility, exit of hot money from emerging/frontier markets.” Focusing on stock valuations, the report concluded that Qatari stocks remain cheap with prices at 10.4 times earnings (P/E). The dividend yields are also at a strong average of 5.6%. This makes Qatari stocks more attractive to investors compared to other GCC companies, with Bloomberg’s GCC 200 trading at 10.8 times earning and a dividend yield of 4.9%. Another factor was that Qatari companies were trading at a discount to their historical averages. The index is currently trading at a trailing twelve month P/E of 10.08. The P/E ratio of the last 10 years is at 12.95, this represents a 22.2% discount. The third reason was for technical reasons. The report noted that the declines in 2005-2006 and 2008-2009 by 54.8% and 66.5% respectively were followed by increases of 112.4% and 118.5% in 2007-2008 and 2008-2011 respectively.